We just rowed How to Bake an Apple Pie and See the World for Five in a Row recently, and it's been apple season here, so of course I've been looking up new recipes and activities to try out. I came across a few apple bird feeders and realized that would be a fun nature study activity for the kids, and we could use the windblown and bruised apples for it. I set up a big picnic table cloth so we could work on the ground outdoors. The basic concept was to slather an apple in peanut butter, roll it in bird seed and hang it from a tree. I saw some that peeled the apple, and some that didn't. For the record, we tried both and didn't particularly find one "better" than the other. We tied string around a screw, poked it down into the apple and hung them from trees. I would recommend inserting the string and screw before the peanut butter and bird seed, because it can get messy. I would also really recommend making sure everyone's apples are covered in peanut butter before bringing out the bird seed. If not, you might possibly end up with a jar of peanut butter that can only be used for bird feeder crafts from this point forward. One of my kids wanted to play and throw bird seed more than anything. But then she decided she wanted to make her own, and she worked diligently! The kids had fun, and chose different places to hang their bird feeders. 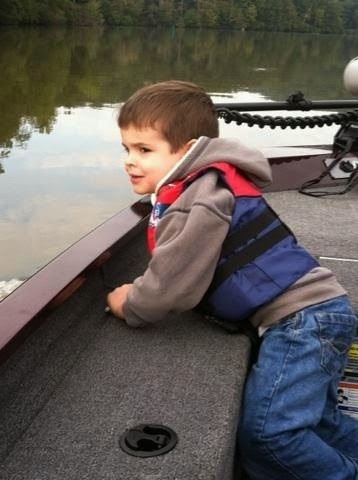 This is something kids of all ages can do! It goes well with apple tree studies or bird studies, but it would be a fun winter craft as well. 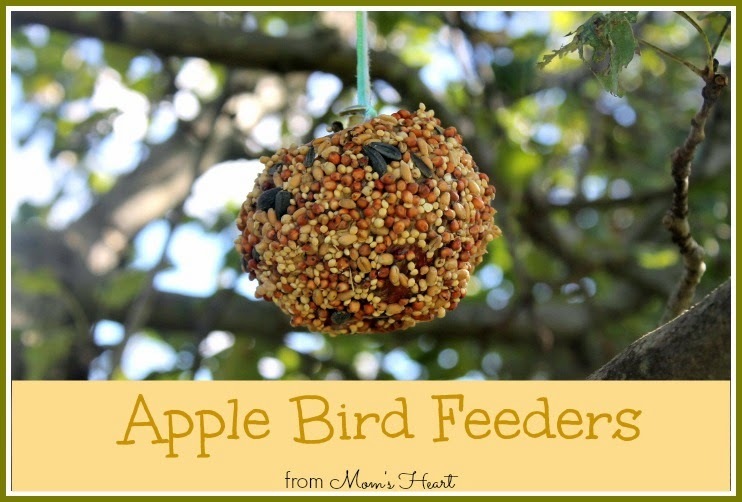 Another one I want to do with some of the less favorable apples is to make dried apple bird feeders so hopefully we'll get to that soon! "I don't know how she's going to do it when the baby comes." That it being referred to is homeschooling. Sometimes I hear those comments, and I begin to doubt myself. It is hard enough right now. As of right now, I have an (almost) 8 year old, 5 year old, 20 month old and we're expecting Baby #4. My time and attention are pulled in so many different directions as it is. How will I feel after sleepless nights and the demands of a newborn!? 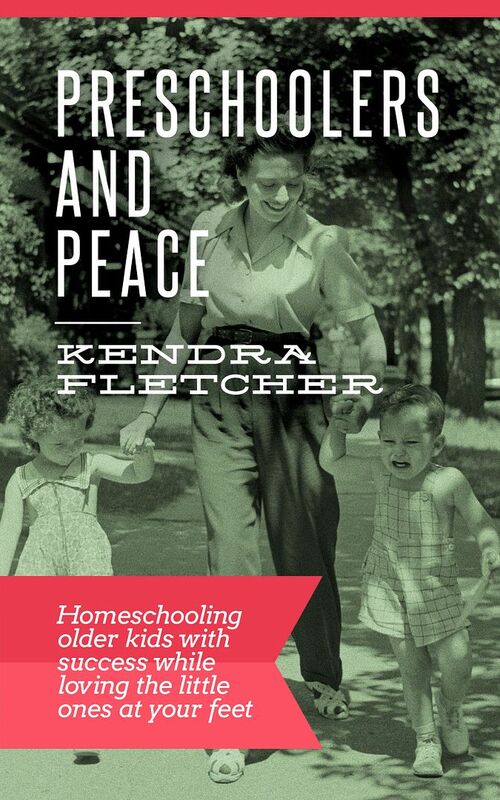 When given the opportunity to review the book Preschoolers and Peace: Homeschooling older kids with success while loving the little ones at your feet by Kendra Fletcher, I knew there might be something in there for me. From the author of the website Preschoolers and Peace, Kendra is the homeschooling mother of 8 children who range from homeschool graduates down to early elementary age. 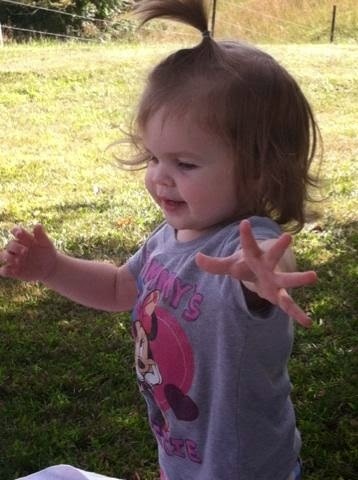 As you can guess, this left her with many years of homeschooling big kids with little ones in the house as well. Kendra has the experience, and I was definitely interested in what tidbits of wisdom she had to offer. Preschoolers and Peace is a "best of the best" e-book, pulling the best articles from her website into a concise and easy to read book for parents. There are 14 chapters, but they are short and easily read during a commercial break. In fact, the book is only about 50 pages, so the whole book can be read in just one evening. Some of the chapter titles include What a Homeschooling Mom Needs, Planning Around Preschoolers, How Do I Keep Them Busy? and When Momma is Worn Out (or Pregnant). You can see she's got a variety of content, and she touches on many of the areas that might affect a homeschooling family. Kendra is full of practical advice. She offers samples of her schedules, ideas for entertaining and educating those sweet little people, and even ideas for helping other daily activities go smoothly, such as meal planning. In addition to the helpful advice, Kendra also provides an extensive list of additional reading and resources that they've used and loved in their own home. She also offers encouragement. Real encouragement! It's so refreshing to find a mom who is simply saying "I get it and I know it's hard" instead of a "this is how you should do it because this worked perfectly for me" lecture. Frankly, I find it an encouragement to all mothers, preschoolers underfoot or not! The book does sometimes waver between a semi-formal workshop talk from Kendra, and a casual conversation. You feel the conversation coming on when words like "gotta" creep in. She's keeping it real. I will say that the first two chapters are solely based on the author's faith and prayer life -- this may not be what you expect from the title of the book, but for those who need to be knee deep in prayer, it's raw and honest. Did I mention Kendra keeps it real, and all with a touch of humor? 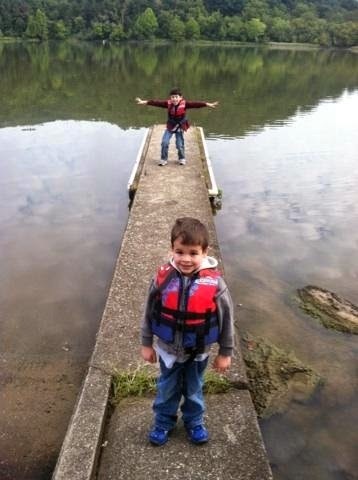 It's a look at a real homeschooling mom, living a real life, and learning real life lessons. This book is an e-book and only costs $2.99 right now! For a quick and inspiring read, you can't go wrong with Preschoolers and Peace! 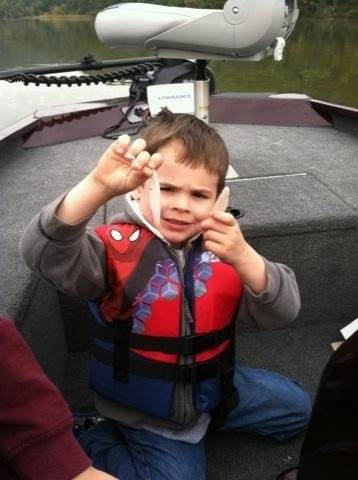 You can find Preschoolers and Peace on social media! As always, remember to check out more crew reviews! After our first row of Truman's Aunt Farm, our intentions were to study Japan next, at Elliott's request. After browsing our library, I decided to just order the books, but that meant we had to wait on shipment and delivery. So we jumped into another fun row that I had mapped out in my head already. 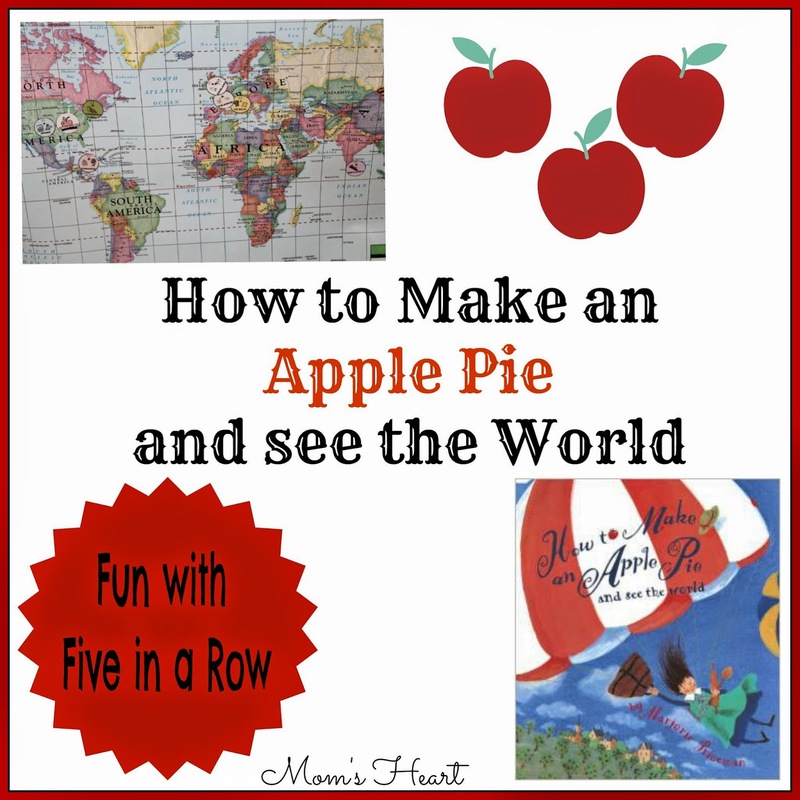 How to Make an Apple Pie and See the World by Marjorie Priceman is perfect for the autumn season rolling in, and we had some apples that needed picking. I knew the boys would enjoy the hands on activities that went with this book! It worked out nicely too, because the week we rowed this book, we took Friday off for co-op, and this was the book used the first week of their World Cultures class! We spent those 4 days at home rowing. The next week Daddy was off work, so we didn't "row" but we still did a lot of hands-on activities like apple picking and baking. I'm grouping our activities by subject again, not necessarily the order we did them. I adapted this simple Apple Fun worksheet for Emory. I created a copywork page for Elliott using Worksheet Works and the opening page of the story. We discussed the lesson in the manual. Elliott decided the humorous part of the story was that she went all over the world to get ingredients, probably because the store that was closed was the only store around. We did this Apple Letter Recognition game. He's into coloring type activities right now, so I am going with it! I colored and laminated the "cards" so they could be used for other activities like matching (there's a capital and lower case set) and ABC order. I also offered him this Color the A's worksheet from Education.com. I circled the capital and lowercase letter in the appropriate colors because I needed to walk away from the table for a few minutes. When I returned, he promptly informed me that I didn't tell him how to color the apples, so I knew he circled them just to be a turkey. Later in the week I found a whole packet of Do-A-Dot apple themed printables, and he did several of them by request. The bingo markers don't come out often, so that was probably the most appealing part. This book fits so well with Elliott's interest in geography! We looked up all the countries that the girl traveled on our world map. We followed their path with some cute story disks that show ingredients for each country (found on Mud Puddle Soup). The boys took turns placing the disks on the right location. Another day, we used this printable map (from Wonder of Learning) with ingredient list to review and mark the countries where each ingredient was picked up. We also drew a line across the Atlantic Ocean to the Caribbean Sea for the gathering of the sea water. Emory only wanted to color his map, which was fine with me. He was still present for our discussions and mapping activities, and it's about exposure for his age. We discussed measurements and cooking from the manual as it occurred naturally with the cooking, which you will see shortly. No, I'm not sure what his fascination with the black bingo marker was. I found this little Around the World printable and it matched the around the world theme of the book so well. It was an easy, quick review for Elliott. We discussed the topic of humor as presented in the manual, but didn't pursue the other art lessons in the manual. Elliott drew an apple from the Draw Write Now book. We discussed how apples aren't really circles, but have distinct shapes. We studied Apple Butter Making by Grandma Moses. I used some of the lessons from Everyday Easels (from SchoolhouseTeachers.com) as discussion points when I presented the art, but this was more about exposure to new art than anything else. 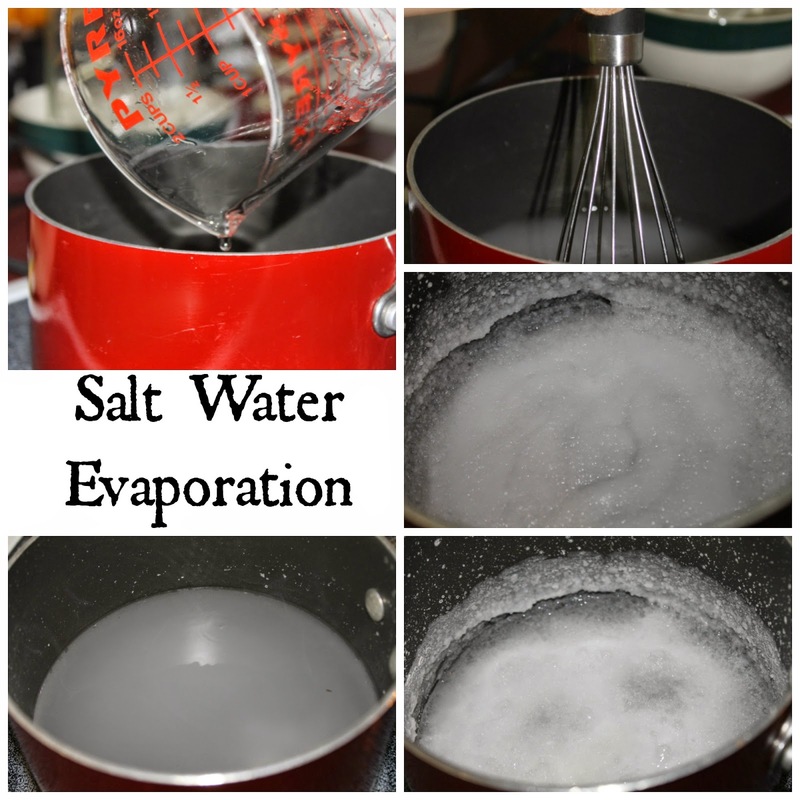 The lesson in the manual dealt with salt water and evaporation. We would have done this outside, but it was a dreary, rainy week, so we boiled our water to evaporation. The kids still found this neat, and Elliott was able to make the connection between the evaporation of the water from stove top heat and the evaporation of mud puddles on sunny days. We've done apple tree studies before, but this time it was informal. 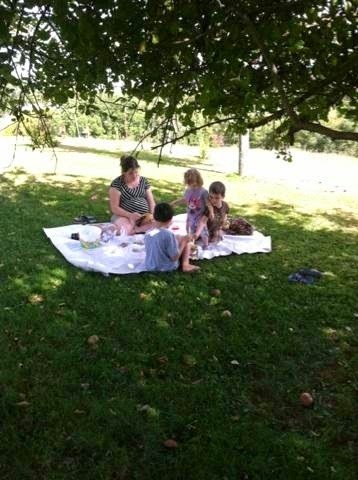 We enjoyed picking apples from maw-maw and pawpaw's trees, and we even planted some of our own trees! We also made apple bird feeders! We have cooked apple stew from the cookbook, as well as applesauce, caramel apple pork chops, apple pie, apple bread and apple cinnamon muffins. Apple fritters and apple dumplings are still on the list. This time, Japan (with A Pair of Red Clogs and Grandfather's Journey) really should be our next theme, but I imagine it will take us a few weeks to get through it! This post is linked up to the Five in a Row Blogroll, My Week in Review, and Weird Unsocialized Homeschoolers. You might remember when we reviewed Maestro Classics earlier this year. We fell in love. I had already heard so many wonderful things about this company and their music, and now I know why. It is all true! If you don't remember my gushing review, the simplest thing I can say is that Maestro Classics offers a delightful family-friendly tool for music education! I am not great at adding music to our studies, but they make it so easy. Pop one of these CD's in during a car ride, and the kids are captivated! They are educational and entertaining for all ages and my whole family enjoyed them. We reviewed The Sorcerer's Apprentice and My Name is Handel, and since then I've added Peter and the Wolf and Casey at the Bat to our collection. My wishlist includes the rest of the titles! They have an eclectic mix of titles, which means their is probably something for everyone. Grab Mike Mulligan and his Steam Shovel for your preschooler, Carnival of the Animals for your animal lover, or The Story of Swan Lake for your ballet fan. These CD's aren't just music and narratives though. They are packed full of educational potential. Maestro Classics offers a Kids Club and Educational Materials, which includes homeschool materials! You can follow rabbit trails or create full unit studies for the different titles! 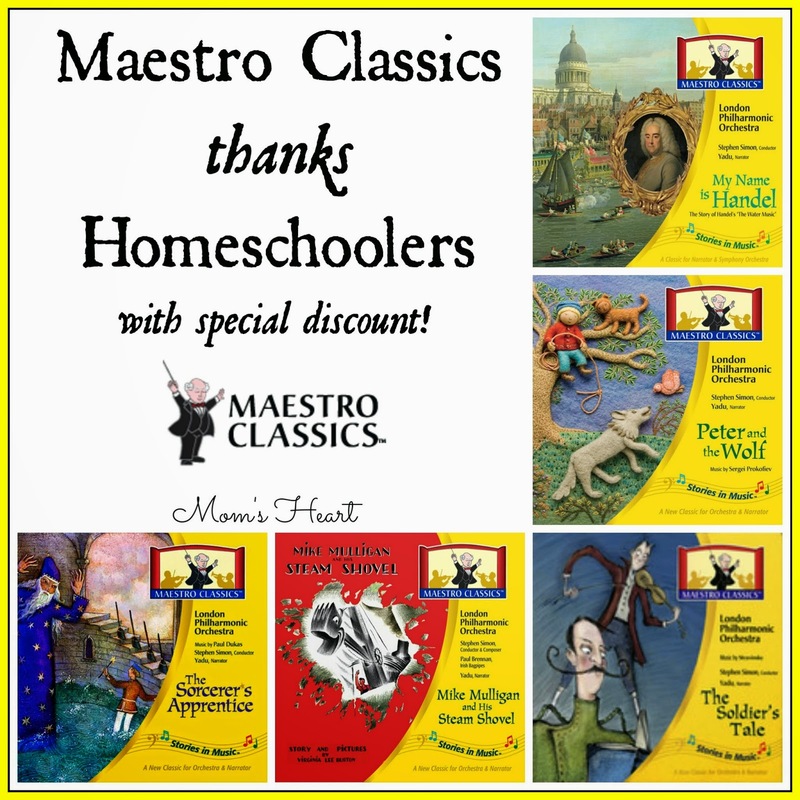 Maestro Classics is now celebrating 10 years, and they are specifically thanking homeschoolers for their loyalty! This is an awesome gesture, and a fantastic opportunity to purchase some of their delightful titles. Now through December 10th if you use the code MOMSHEART you can receive 20% off your music orders (does not include shipping) at Maestro Classics Store. You need to purchase through this store and there will be a place to apply the code MOMSHEART before you complete your order! Take advantage of this generous offer while you can. These are great for any time of the year, but they would also be great stocking stuffers or give you something fun for long car rides over the holidays. They are also a unique way to ease back into the school routine after the holiday rush is over! Are you a Maestro Classics fan? Which one is your favorite? If you buy any new titles, let me know! 1. This has been a great week. The husband was off, and I'm pretty sure this was the first time he's ever taken a whole week off that wasn't for our vacation. Or the birth of a child. It was so nice to spend a week doing "nothing" even though we kept busy. 2. Since husband was off, we got a lot of house cleaning done. We're purging, and we removed tons of clothes, junk and useless clutter. It is so nice to see the transformation of our house coming together! 3. It's apple season! I've made applesauce and apple muffins so far, and caramel apple pork chops for dinner last night. I'm undecided on what else to make, though I saw an apple salsa recipe that looked good, so I'm debating on it. 4. I have a thing for Applebee's fiesta lime chicken. I found a fiesta lime chicken copycat recipe and we had it for dinner tonight. We *loved* it. It was delicious, quick and easy, which is my favorite dinner combination. It is definitely going on our dinner menu rotation! 5. Even though we've been on vacation this week from school, I've still seen the organic learning. I've seen math skills with budgeting spending money, language arts with reading/writing comics, practical household skills with helping us clean and do minor repairs, and nature study with the apple picking and fishing. 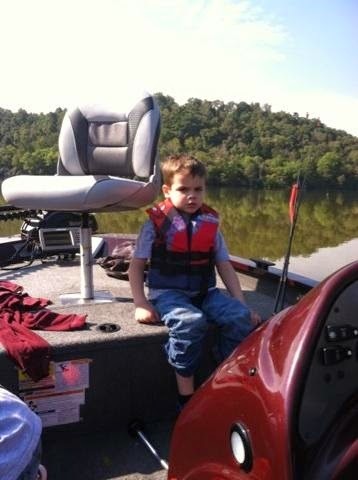 They had a great time fishing and made sure to tell me everything about the boat, how the GPS worked, how Emory wasn't scared of finding juicy worms, and every other detail. 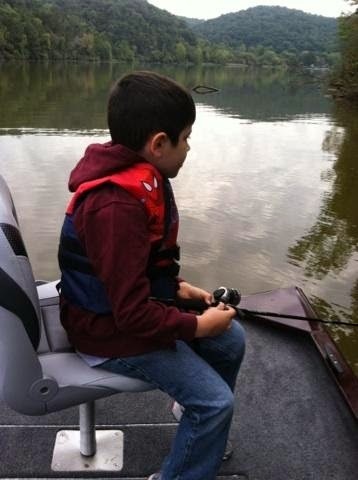 I forget how easy it is to find those natural learning moments, the ones that make learning come alive. 1. The husband and I just celebrated our wedding anniversary. He's the definition of an amazing husband, plain and simple. 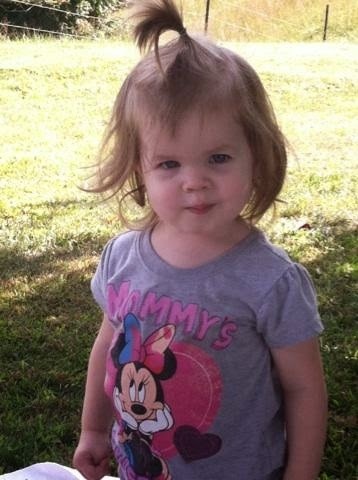 Faithful, loyal, loving, considerate, and not to mention a wonderful Daddy. I am so blessed. 2. I've never really gardened before, but I am seriously thinking we might be adding some fruit trees and berry bushes next year. My kids are massive fruit eaters and by the time the trees would really start producing, the boys would be pre-teens. So now I'm researching my head off. 3. My husband and Elliott both mentioned to me (without knowing of the other doing so) that they wanted cherry trees. Husband wants a lemon tree. He also mentioned that the grew grapes along the barn as a kid. I was thinking of the obvious, like apple and peach trees people. 4. I need some new audio book suggestions for the boys. We're finishing up the first book in The Boxcar Children series (which is where Elliott's initial cherry tree request came from) and we have 2 & 3 on audio book as well, but with the amount of time we're in the car, it doesn't take long to get through a book. I do have Stories of the Pilgrims from a previous review but I'm thinking I'd like to save that for November and perhaps use some of the suggestions from the study guide to make a fun seasonal unit study for the boys. 5. Co-op finally started. The boys were so excited afterwards that they were talking over each other to tell me about their day. Apparently the teacher of the LEGO class was amused with the 5 year old and his imagination. HA! It was a Free Build today, but I admit, I wonder how he will do in future classes with the more structured activities. He is the creative, outside the box, doesn't want to be told how to do his LEGO creations kid. Do your kids like music? 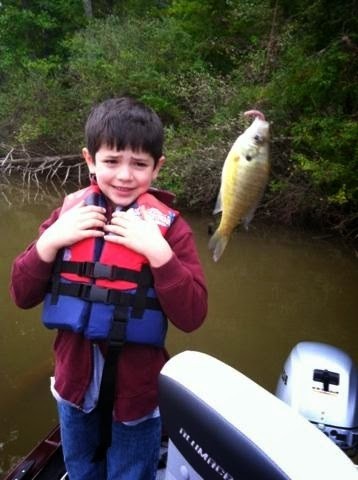 Are you trying to teach them positive behavior and character traits? Are you looking for a fun and memorable way to combine these two? How many times do you get the lyrics to a song stuck in your head? There's just something about dancing and singing to a catchy tune that makes a lesson more memorable, especially for kids! If you're wanting some music that is both kid-friendly and adult-approved, you might want to look into Happy Kids Songs. What is Happy Kids Songs, you ask? 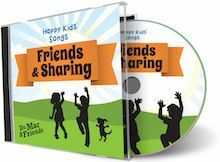 Happy Kids Songs is an award winning series of full-production songs brought to you by Dr. Mac. You may be be familiar with Dr. Mac already, an award-winning songwriter, and director of music behind the children's PBS hit Jay Jay the Jet Plane! 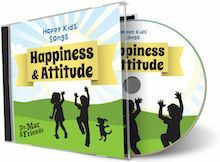 Also a child psychologist, school consultant and lecturer, Dr. Mac designed Happy Kids songs to help children develop stronger social and emotional skills. The music is also meant to bridge the gap between preschool music, which some kids might find "babyish" and mainstream artists who typically have lyrics and themes that are definitely inappropriate for children. As parents, it is our responsibility to make sure the music our children are exposed to is not just entertaining, but also purposeful, edifying and appropriate for the maturity level of our little listeners. Dr. Mac makes that easy! The Schoolhouse Review Crew was recently asked to review three downloadable albums: Friends & Sharing, Happiness & Attitude, and Manners & Character. The sets each have five songs and are available for $4.95. They come with a free download of the lyrics, as well as coloring and activity pages. 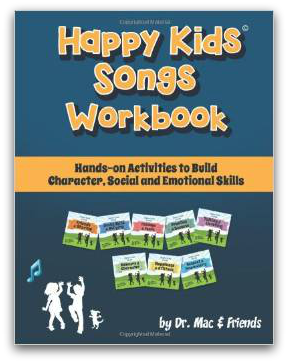 Also made available was a physical workbook called Happy Kids Songs Workbook: Hands-on Activities to Build Character, Social & Emotional Skills. This book ($12.56) has 125 pages to cover all 8 albums from Happy Kids Songs. It includes the lyrics and a coloring/activity page for every song, as well as over one hundred lessons and activities, which include everything from arts and crafts, games and kinesthetic activities! I love that they have included activities that will appeal to different learning styles, because we all know that every child learns differently. Between the music and the variety of activities, this is certainly a multi-sensory program. As you can see, Dr. Mac understands the types of issues and behaviors that children this age struggle with, and has worked to create a unique way to reach them. The songs are performed by children and adults alike, and the program is geared for children 3-8 years old, but the music may have appeal to older and younger kids as well! You can listen to the samples for yourself, but even my toddler liked to bop along. In addition to family use, this would be perfect for the car or even quiet time music. With listening the music, singing along, dancing, and thee workbook component, this would also make a fun class for a co-op! You can find more information about Happy Kids Songs on their website, Facebook, Twitter or YouTube, and of course you can read more crew reviews!